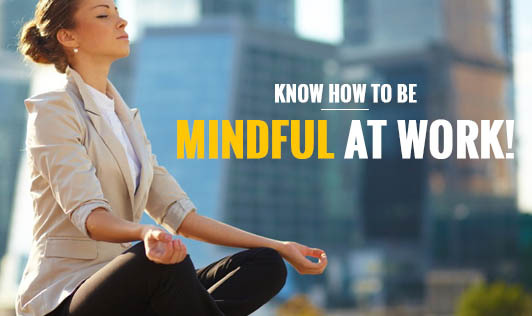 Know how to be mindful at work! For most people, work is like a pressure cooker. Even if the job is less demanding, there's still an aspect of stress. Work comes with high expectations, tough tasks and requires fine results. Practicing mindfulness at work soothes and calms the body. It improves one's ability to work effectively and produce great results. Even when stress strikes, instead of getting besieged, it helps one to confront challenges head-on. Remember, the more you practice mindfulness, the more likely it is to become your default way of being at work and you will notice measurable differences in your outcomes!